A delicious and succulent salmon roast ready in minutes! Line your sheet pan with parchment paper (or you will scrub forever). Set aside. Salt your salmon all over. Combine the coconut aminos and orange juice in a shallow bowl or container, large enough for the salmon. 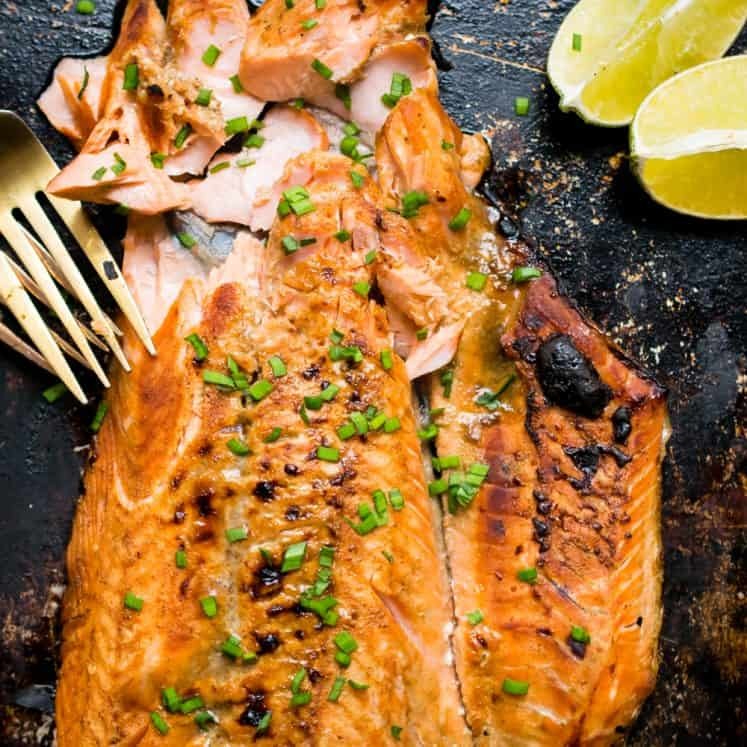 Put your salmon meat side down in the marinade. Let it sit for 20 minutes. Set the oven to broil 550F. Place the salmon skin side down on the parchment paper. Pour the marinade (olive oil, juice and aminos) over it. Broil for 8 minutes right under the broiler, or until the salmon is cooked, flakes easily with a fork. Check every minute after 8 minutes until it’s done. Remove from the oven garnish with chives. Serve hot! Goes well with The Best Roasted Broccoli, Crispy Fried Rice or Brussel Sprouts. See post, you can also use premade coconut aminos based marinade like The New Primal.